Sally and I visited the Hong Kong Ocean Park in the late afternoon of a dreary day. As we walked along a pond next to the aviary, we saw a patch of water by the distant shore some fifty feet away churning with thrashing fish. We looked more carefully and saw a lone black swan standing on the embankment above the splashing fish. It dipped into its birdfeed trough, then turned and lowered its head into the water; and the water around its head churned as fish went into a feeding frenzy. The swan would then repeat its action and the fish would thrash again. We watched with amazement at this unusual phenomenon for a few minutes. 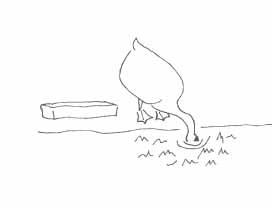 Apparently, the swan was deliberately feeding the fish. As swans are lifelong monogamous birds, we surmised that the swan lost its mate and found solace by keeping the fish as pets. Unfortunately, we did not have our camcorder to record this serendipity, and our camera did not have a zoom lens to capture the endearing moment in the darkening dusk. Hopefully the attached drawings can demonstrate this scene. Posted by Robert Wu on Monday, December 9, 2002, at 6:03 am. Filed under Uncategorized. Follow any responses to this post with its comments RSS feed. You can post a comment, but trackbacks are closed.